This is the spot to share your Big Island snorkeling stories, tips and pictures, and read what other people have experienced on the Big Island, Hawaii. You can also ask any questions that have not already been answered below. 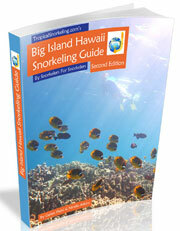 Also be sure to read our pages of information about snorkeling the Big Island. Click below to read the Big Island snorkeling stories and questions that other people have shared. Feel free to leave a comment or answer a question. Try to keep your comments on topic or start another story in the form above.